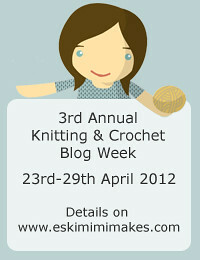 Writing this post is totally my way of procrastinating. I feel like I should be doing a million other things, as you do before a move, but since I actually have the luxury of being moved by a professional removal company who’ll also pack my things, there really is mostly cleaning left. And let me tell you, I’m not keen on that. So instead I decided before I won’t have access to my sewing machine for weeks I’d finish the already cut Jalie in dark purple corduroy that was drifting around my living room. 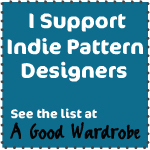 For this, I recruited the help of a couple of fitting books (well, all of the books on fitting I own, actually). What I did in detail was to remove about an inch on the inner back seam, and adding that on the outside seam. 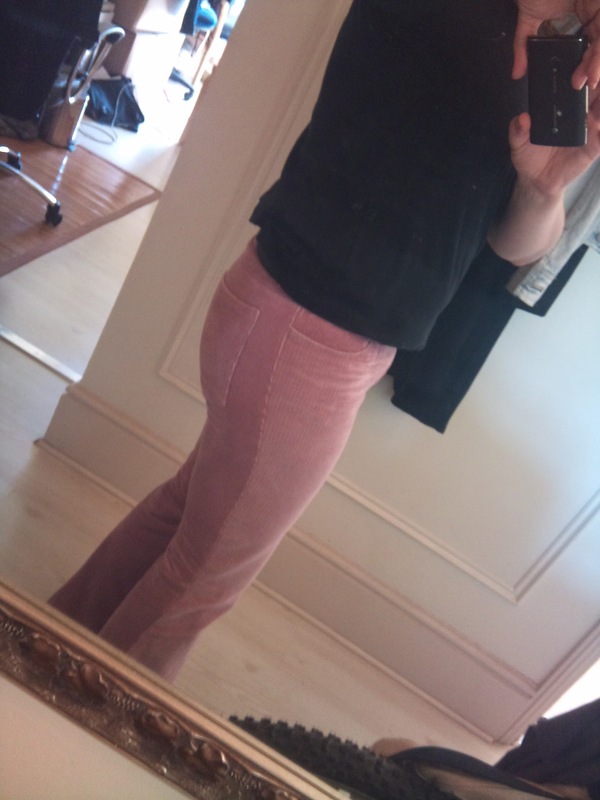 That mostly did the trick, but there’s still a way to go before I can say this is my perfectly fitting jeans, alas. 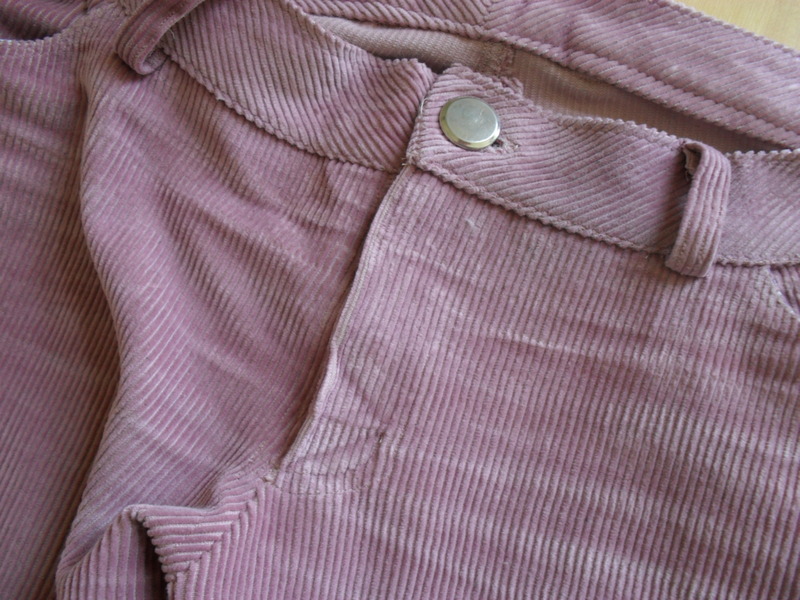 The corduroy I used doesn’t have the tiniest amount of stretch, which makes the whole jeans a tad too tight, but since I’m determined to loose those last 10 pounds I’ve been struggling with these past few months, that should be fine soon. What feels to me like my biggest achievement is the near perfect fly I managed. Not without a hitch, of course … I put the fly guard on the wrong side and had to rip it out and move it to the other side. Ah, well. I’ve put some nice flowers in the front pockets – and realized only during my final fitting session that I’d forgotten to top-stitch them! I guess that should teach me not to sew when I’ve got my mind on other things … but then, it made for a perfectly relaxed New Years Day. And that was my first make in 2013. I don’t know how long it will take to find a place to live, and get my things set up and all, sigh. I hate being up in the air like this, I’m a creature of routine and really don’t deal well with having none at all. Ah, well … it’s only going to be a few more weeks, and then I’ll be living in the glorious sunshine and be coping with a new job and getting to know my new collegues, so overall it’s all great. I just wished I was a few steps further in the process. Happy New Year to you, and may it bring whatever you wish for!! A couple of weeks ago, I made this basic pencil skirt block. Now, as you will have noticed, I’m not really the corporate chic kinda girl, and you might have asked yourself why I bothered. Well, the reason behind this was that I was hoping to be invited to a 2nd interview for a new job. My contract with my previous employer had come to an end, and to be perfectly honest, by that time I was ready to move on. The only fly in the ointment was that there are not a lot of jobs open right now in my field, and the few there were didn’t thrill me. Now, that might sound incredibly spoiled and a tad snooty in times of recession, but I do believe that it’s a better deal for everybody involved if you like your work. 40 hours a week are simply too much time to be spent doing something you can’t draw satisfaction from. Back to the pencil skirt … now, in my line of work, the dress code usually is “business casual”, heavily leaning towards casual – as long as you’ve covered your primary gender characteristics, you should be fine. But interviewing is a whole different affair, and it’s always a good idea to err on the side of caution and let people know you’re willing to make the effort. And a quick, inexpensive and easy make to achieve that – tadaaa, the pencil skirt. 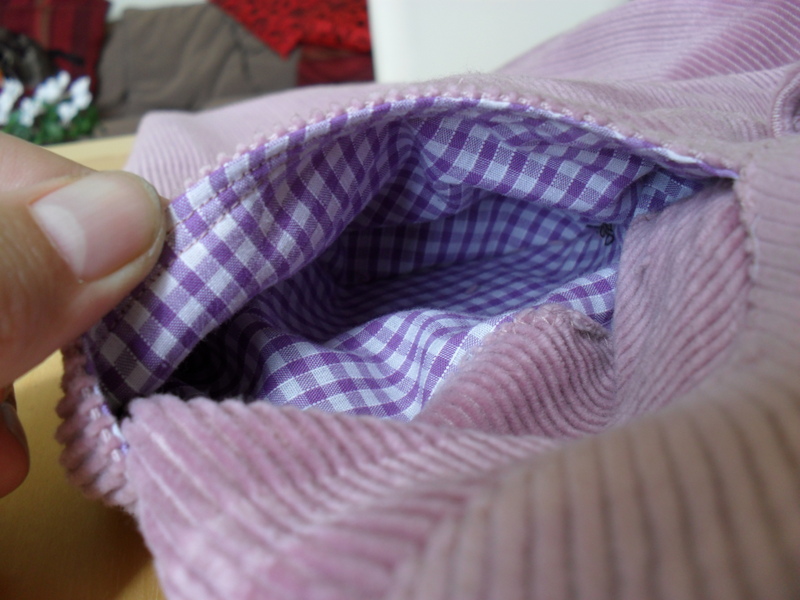 So I bought some purple herringbone suiting and matching lining, and set about drafting a pattern. Then it turned out that I didn’t have to go the the 2nd interview in person, and that the company I was talking to prided themselves in not having any dress code at all (which is not to be confused with not being dressed for work, mind you!). You see, they’re in Gibraltar, where it’s hot and sunny and sometimes really hot and super sunny. Suits just don’t make a lot of sense in that kind of climate. Inspiration For source click on the image, please. I think it turned out well. The pocket flaps are fake, there are no real pockets, which is a bit of a bummer, and I’ve hence tried to wrap my head around how to include real pockets underneath, without a real result so far. 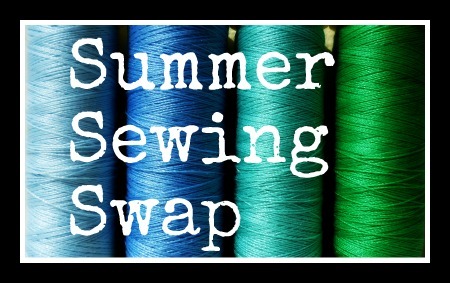 Tips will be super welcome! Really now … For source, please click on the image. Or maybe something with double-welt pockets. Oh, and the job? I’ve got it, and I’ll be moving to Gibraltar by mid January. I am so excited – they have monkeys over there!! 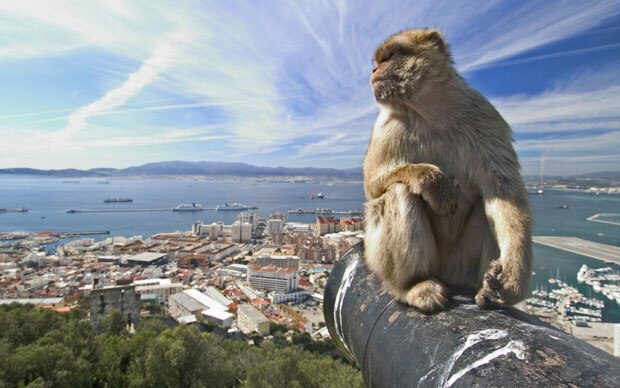 Monkey in Gibraltar. For source, please click on the image. Really, I had the best of intentions and was stoked to finish the thing. For all of 15 minutes. Then I noticed really bad looping of the bobbin thread, and my machine started to make this noise again, and I had an enlightenment. This is a hobby, I thought. One I take pretty seriously, and one that I use to save a little bit of my corner of the world, and also something I do to enjoy myself. I do NOT enjoy hearing my machine make that noise. I do NOT enjoy swearing at little loops in the bobbin thread, and I most decidedly do NOT enjoy breaking needles whizzing mere centimeters by my eye. And that was that. The black cords are in the rubbish bin, I will go hunt for some other fabric (I still want a pair of black jeans), and otherwise forget about this whole abysmal affair as quickly as possible. 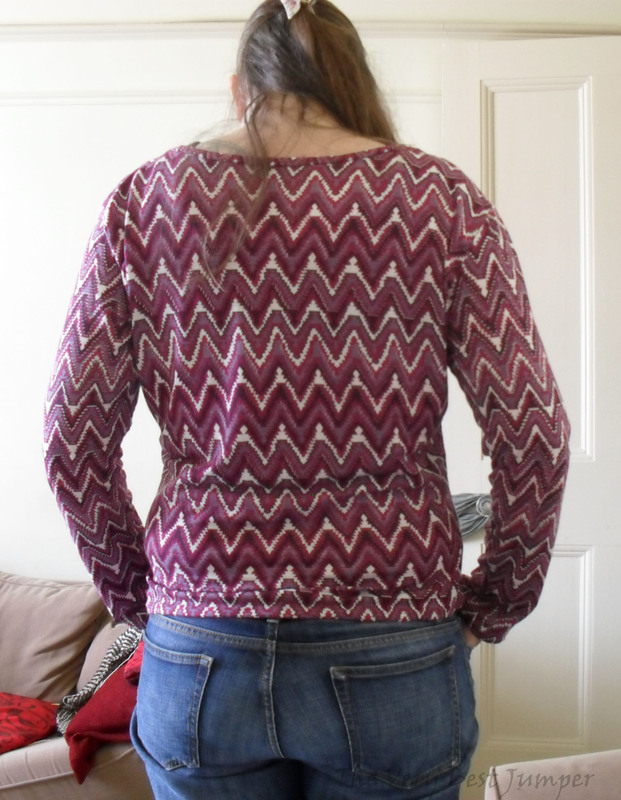 For some instant gratification, I made another t-shirt from the pile of jersey knits I got at Walthamstow during my recent trip there with Kim-ing. This was actually acquired at Saeed’s, and I have a generous 3m of it (the end of a roll seems to trigger some unstoppable urge to get rid of it in their shop assistants – I asked for 2 m, and that’s what I paid for, but got what was left on the bolt). 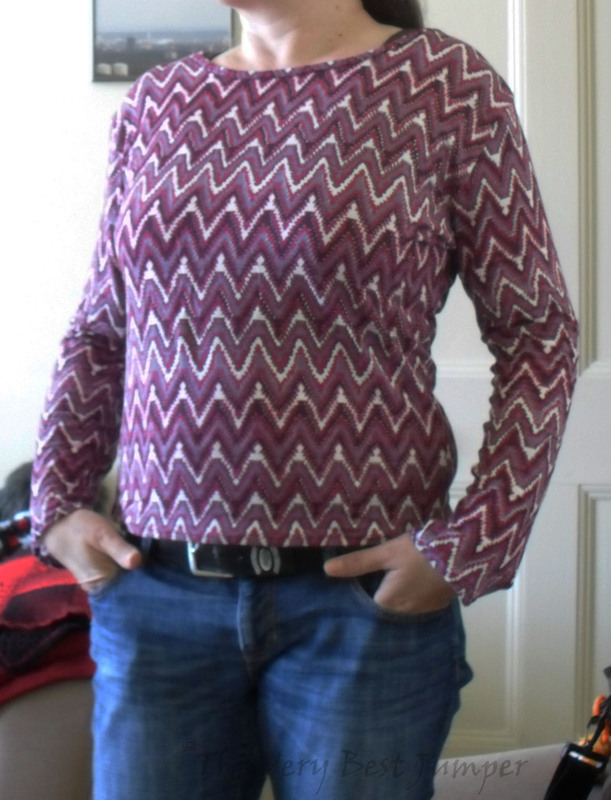 The pattern used was my self-drafted, and that’s pretty much all I’ve got to say about this make. I shortened it a tad to hit on my hips rather than 3 fingers below, and this length seems to work better. This photo had me a bit surprised, I have to say. I’m quite aware of my rather broad shoulders, but man, do I look like a rugby player here or what?? 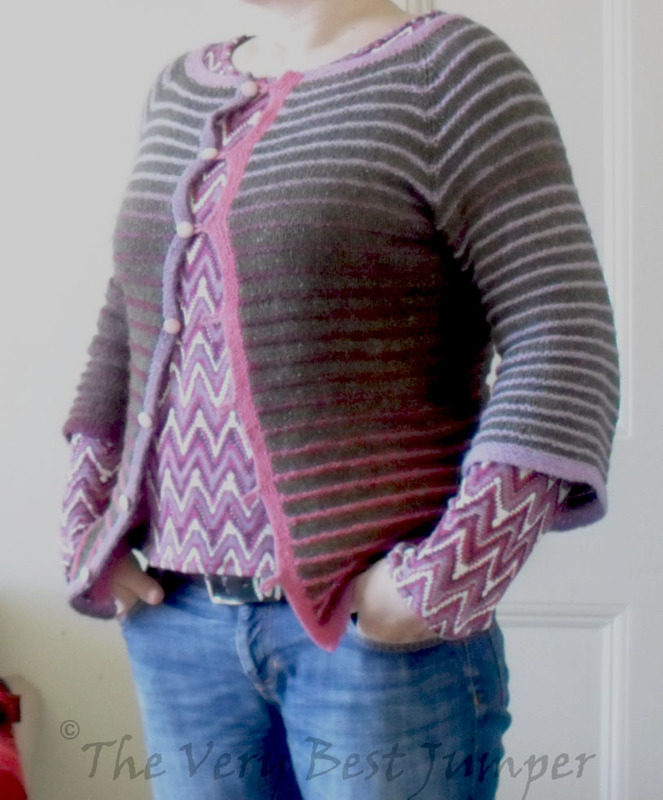 And here it is styled with my beloved Caterpillar Cardi. Is that too much stripey action here? I kinda like them together, but it does feel a tad too psychedelic, no?